A conversation is where it all starts.Messaging is 100% FREE! Singles have more conversations on POF than any other dating app. With us, you’re 2.7x more likely to enter a conversation in your first 24 hours! Join now, and we’ll get you talking to someone before you know it. We also have the most FREE features to help you start dating! You might know someone who's in a relationship/dating because of a match they found on POF. It's your turn!- Use our advanced matching algorithm for FREE- View your matches for FREE! Sort by last online, newest users and more!- Most importantly, send and receive unlimited messages for FREE+ More features than we have room to tell you about! POF is the preferred singles dating app because you can view matches AND communicate with them for FREE (unlike the paid dating apps). Unlike smaller dating apps, POF has the most users and thus, the highest chance for you to find your relationship! The POF Dating App has the most users, generates the best results and is FREE. Tap Install and Join Now!Happy Fishing! 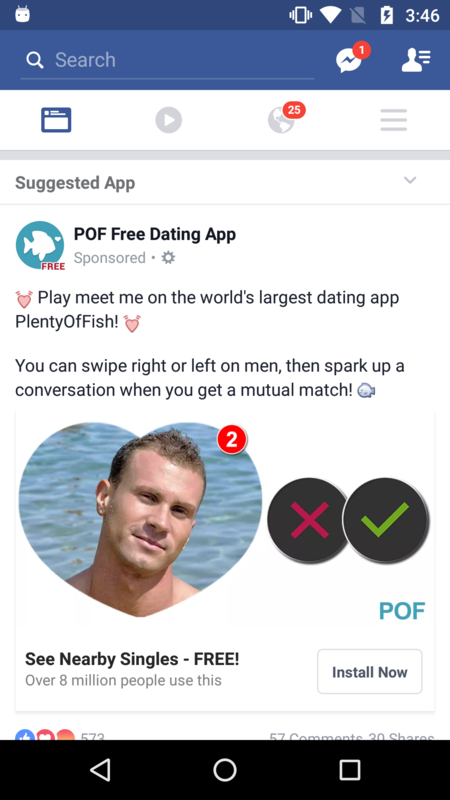 *POF.com is a part of the Match Group, which also owns Tinder, Match.com, OKCupid, Twoo, Meetic, and OurTime.